Hero and the Terror was a big surprise for a number of reason. First, it was better than I was expecting it to be. That's always a good thing. Secondly, it didn't play out the I was expecting either. But I'll get into that later. And most surprising to me was how well this film was made as a whole. Great aesthetic, cinematography, score, cast and performances all make for an excellent 80's Norris film. But wait, I'm getting ahead of myself. This is a Norris film that always seems to slip through the cracks. Maybe that's because it's not the typical conventional Norris action flick. And I think that's what I noticed more than anything. While it starts off strong, it's midsection slows down dramatically, only to finish with a bang. I think this might have been what threw people off. Going in expecting a standard Chuck Norris action film ultimately ends up being something of a cop thriller/drama hybrid. It's commendable, but doesn't always succeed. Yet, it's because of the films other positive attributes that I found enough to like about this mixed bag of genre's. Danny O'Brien (Norris) has captured the serial killer Simon Moon (Jack O'Holloran), also known as The Terror, and labeled a Hero by the media. When Moon escapes prison after 3 years locked up, O'Brien knows it's up to him to bring him down once again and stop his reign of terror. Hero and the Terror came out right in the beginning of Norris's box office slump. Where just a few years before he was a box office star, his films were now beginning to go straight to video, with his brother Aaron directing the majority of these efforts. But here it had someone else in the directors chair in the form of William Tannen, and the film is 100 times better for it. The guy has style, and can executes a sequence well. 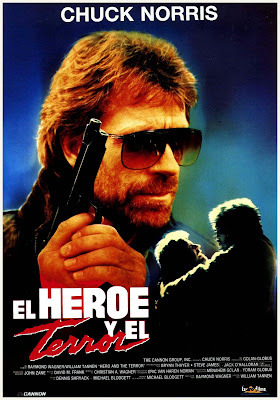 When most Chuck Norris films had fallen into the same droll ho-hum execution under the direction of Aaron Norris, this was a refreshing change of pace. Tannen has a keen eye, and a knack for making this film look so much better than you'd expect. When a lot of nothing goes on for most of the midsection of the film, that goes a long way. I'm not sure what genre this was supposed to fall under, because while it starts and ends as your typical 80's cop action thriller, HatT takes a serious detour for a good 45 minutes in the middle into drama territory with O'Brien (Norris) dealing with the fear of his girlfriend moving into his place, while also welcoming a child into the world at any minute. He's also haunted by his first experience with The Terror (Jack O'Halloran) and knows that he's the only one who can put a stop to his resumed reign of terror on innocent women. Why? I don't think that was ever brought up. I mean, I'm sure there was someone else up to the task, but O'Brien really felt like he was the only guy who could do the job. Good for him. Another thing that raises this several levels above average is the exceptional score by David Frank. It seriously makes the film seem like it's much bigger than it actually is, and because of that, 10 times more awesome. Well done David. Well done. Not one of his most exciting films, but definitely one of his better films, considering everything after this was going straight to video. A solid opening and a killer ending make up for the fact that there's very little actual action in this, as it tries to go for more of a thriller/drama vibe, in which case it only half-succeeds. Regardless, a definite highlight in Norris's career and a much better film overall than you expect it to be.